Do you have a spot in mind for this cottage? It can be out in the garden (if you live in an area that freezes, you should take it inside during the winter.) You can put it on a shelf in your home, but it should be high enough so that it’s out of the reach of cats. 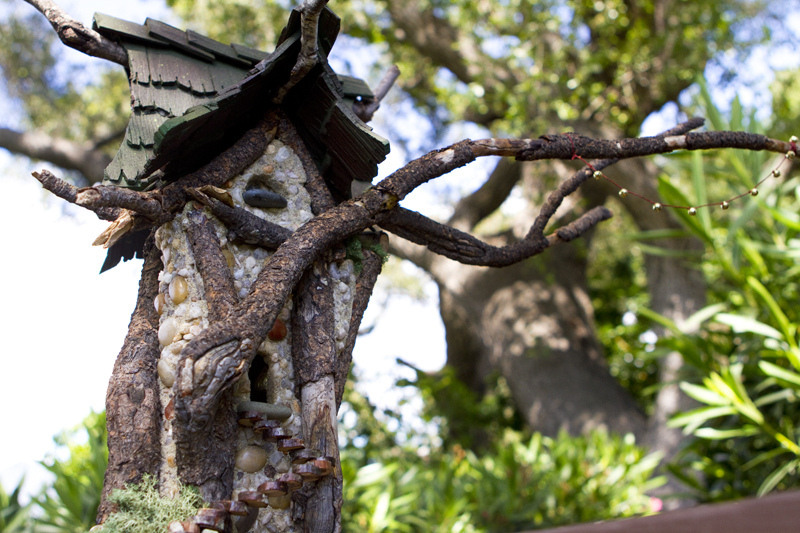 Next to gardens, libraries are fairies’ favorite spots, so a bookshelf is always a welcome place. The best place, by far: a fern garden. Are you willing to give the cottage access to moonlight occasionally? Fairies live by moonlight. They absorb it, they revel in it, and they need it the way humans need water. It is a spiritual experience for them. By placing the cottage in the moonlight from time to time, you are letting the Fey know how important their needs are to you. Are you able to supervise children’s visit with the fairies? We would very much encourage children to develop a love and respect for the Fey, and part of that happens by being able to touch the cottage and open its door, and take off the roof. However, sometimes little fingers accidentally press a bit too hard on the fragile fairy glass in the windows. If it breaks, it certainly won’t hurt them, but it will be impossible to replace the window later. Fairies have been known to inhabit almost anything they take a fancy to, but old clocks seem to hold a special fascination for them, as do grandfather clocks. I’ve heard from other people that they’ll even mess with alarm clocks that have a bell in them. Bells and fairies….long story there. 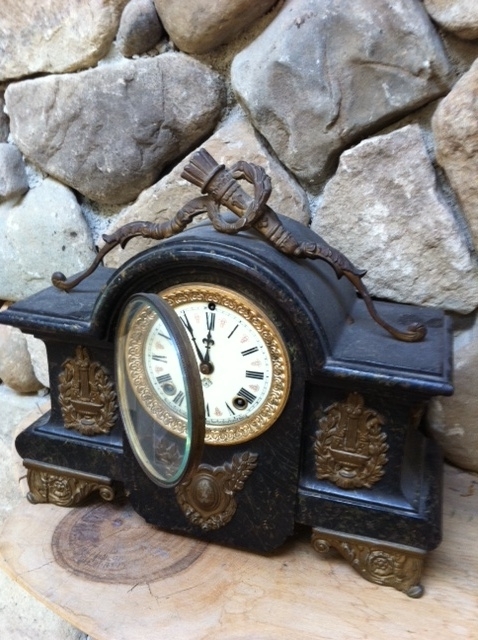 My own mantel clock that I inherited from my grandmother is a beautiful old thing that hasn’t worked since 1963. Apparently, the Fairies don’t care about that. They take particular interest in the glass door that covers the face. The old hands on the face are very delicate and I don’t want to have to dust them often, so before I go to bed I make sure the door is firmly closed. And, like clockwork (hmm), that door is wide open when I get up the next morning. I think they swing on it, and push each other on it like a rope swing, laughing hysterically. They fall off a lot and drop five feet to the floor, but that seems to be part of the fun. The door is irresistible to them. There is a one inch clearance under the clock, that, when I move the clock to clean, is strewn with and odd assortment of fairy droppings. An empty aluminum tealight cup, some hot pink bookmark tags (by Post-Its, of course) a finch feather from my aviary outside, a popsicle stick with runes scribbled on it, the cap off an acorn (we live in an old oak grove) which has been filled with sand. I recognize that sand. It’s from the special sand box in my studio where I make the fairy cottages. They play in it all the time, throwing it on the floor, hiding my tools in it, or leaving me gifts in it. (I recently found 9 tiny brass bells buried in the sand, so they went on the cottage I was building at the time, called PineSong.) I’m not quite sure what to do with the droppings. Leave them? Throw them away? Relocate them to the fairy altar? What do you think? 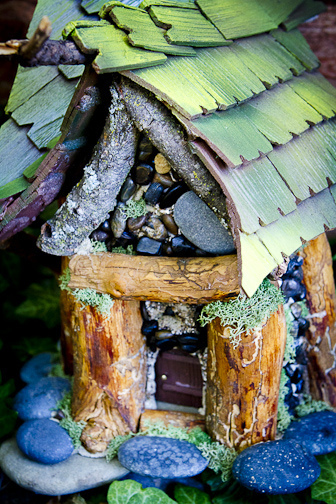 If you’ve found any fairy droppings, please tell me about them. I’m just going to say it straight out. Fairies take things. They have a very skewed sense of ownership, as in, if I live here, I must own it; therefore I’ll take this pretty thing. It’s not the queer two dollar bill your Auntie gave you for your 10th birthday that they want. Value as we see it has nothing to do with value the way a Fairy sees it. They’ll take a pad of Post-It Notes with 2 left on it. Or the only sharpened pencil in the cup. Or the back off my earring. Not the gold earring, mind you, just the back. 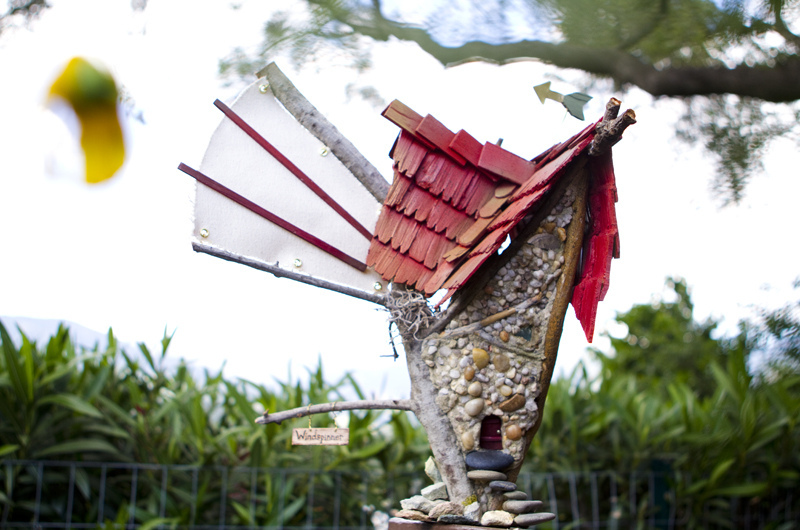 Some have suggested that they aren’t fairies, but rather, Borrowers. Well, no Borrower I’ve heard about would want the back off my earring. There’s absolutely nothing they can do with it, and besides, Borrowers are only after practical things they can re-purpose. It’s impossible to know what a Fairy will be attracted to. Many say they love bright, shiny objects, but how shiny is a Post-It Note, exactly? And have you ever seen the back of an earring?? 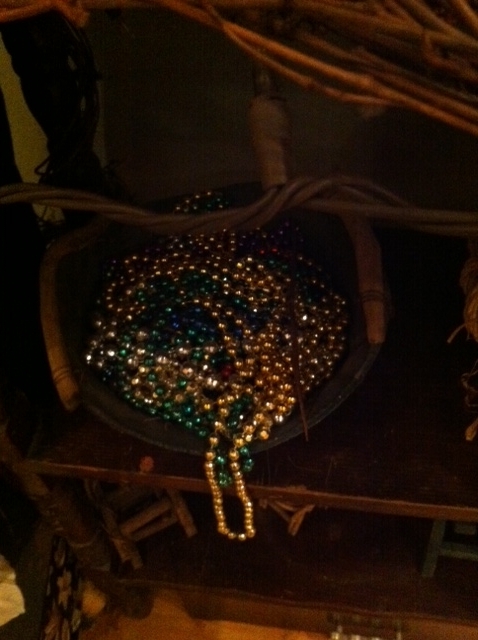 I do have a bowl of plastic Mardi Gras throw beads to which they seem attracted. At least they poke around in it a lot. I found just one strand pulled out of the bowl...like they changed their minds suddently. They never take any, though. I suspect they’re bummed out by the plastic aspect of it. Yet, they absolutely adore my tiny wind-up plastic chicken that lays jelly bean eggs when she walks. I think they wind it up and watch it walk at night. It sends them into hysterical gales of laughter and they crowd around it and shove and poke one another, and take turns marching up and down the bookshelf imitating the chicken. The next day I’ll find that chicken across the room on a high bookshelf, with jelly beans strewn across the floor. They don’t eat the jelly beans, but they do love to throw them at one another. And that one sharpened pencil in my desk cup? Later that day I found it (with a broken point, of course) sticking out of a book on fairies on my nightstand. They’d scribbled in the margins a bit and corrected a few of the author’s errors. Ahem. Occasionally, they’ll take something that is important to me, and I’ll have to ask for it back. Like my glasses. They are either in my purse or on my face…nowhere else. Suddenly gone. My fault, having left my unzipped purse in the dining room. I should have known an open purse would be irresistable. I was desperate to get the glasses back, so I wrote a very small request on (what else) a Post-It note, and left it on the fairy altar in the dining room. 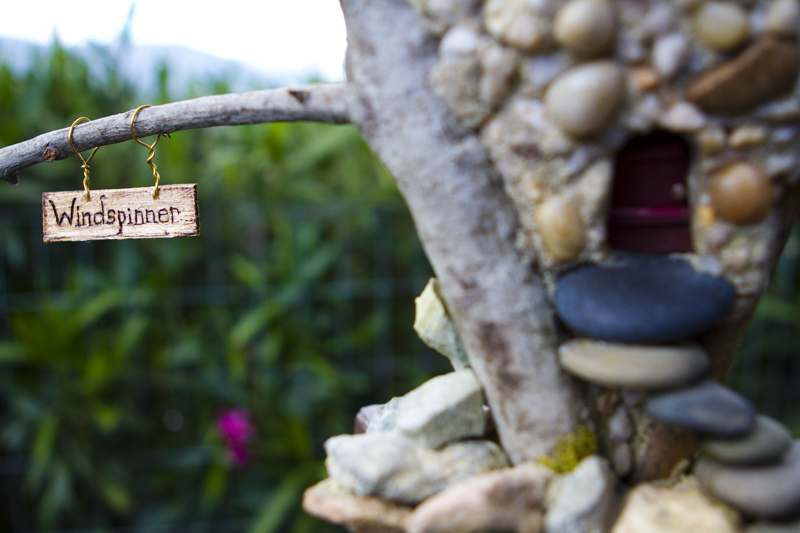 I put a small cup of fresh water on top of it….fairies need fresh water and will be attracted right away. Then I waited. The cat drank all the water, so I had to refill it a couple of times. Two days later I heard a crash come from the dining room, and running back in, I found the cat staring intently up at the ceiling, where my glasses swung every so gently and precipitously from the chandelier. 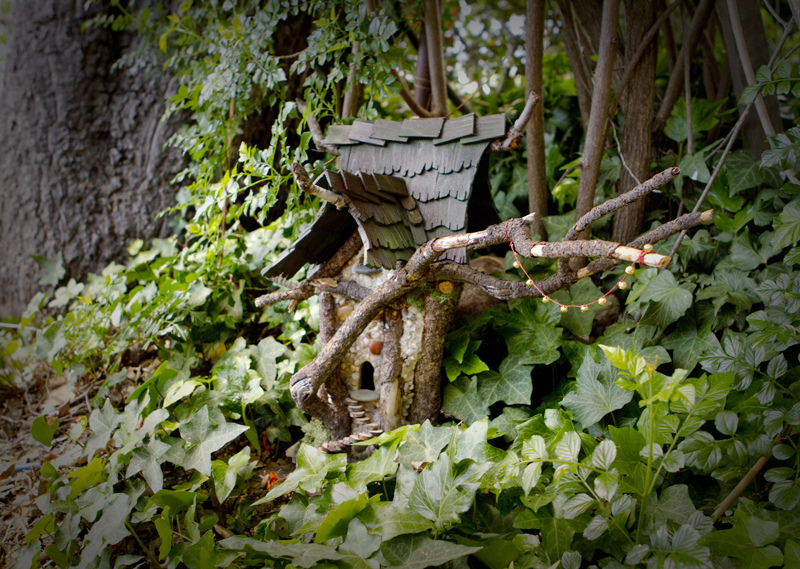 The fairies of Windspinner Cottage live in tree branches when they’re on land. They spend most of their days running over the surface of ponds, lakes, and anywhere they can find quiet water. Fish are sometimes fooled into thinking they are little insects on the surface, but are never quite quick enough to actually catch one. Why the constant movement on the water’s surface? It is thought that they have something to do with oxygenating the water in quiet, slow flowing places. Their shoes are like little cushions that allow them to glide over the water’s surface tension, without breaking the surface. The slightest breath of a breeze can propel them 15 feet if their wings are fully extended. When they asked for a cottage of tree branches, I was happy to oblige. When it was finished, I sat in my studio and stared at it. There they were, again, nagging me about something. (This was a very vocal group.) It isn’t finished yet, they said. There is something more, they said. For the life of me, I couldn’t figure out what it was. So I went to bed. The next day, the moment I sat down in front of the cottage, they cried out, “Make a sail! Make a sail! We need a sail!” On a tree branch house? Never second-guess a fairy. Just go with it, I thought. So here is Windspinner, under full sail.